While many people love high-end décor in their homes, there is always a conflict between personal desire and the budget. This is one scenario that often plays when it comes to the dining room. However, you do not need to have an expensive room to make the room appealing. Instead, you can make your home an irresistible paradise by giving the dining room an expensive outlook. One simple upgrade that can transform the dining space is adding a new coat of colour. Painting the room is inexpensive, easy, and can help to highlight your unique sense of style. Think of painting the room with a light gray colour that has lilac undertones to highlight a tinge of sophistication. The other effective method of making the dining room look expensive is using the dining tables. Here are easy to use tricks that can help to make the dining space look expensive with reclaimed wood dining table. There is nothing as enthralling as enjoying a fancy meal in your fancied restaurant. You can replicate the same thrill back at home. The focus should be creating a romantic vibe that will turn every meal into a special occasion just like it happens at the restaurant. To make the dining experience even more enthralling, consider improving restaurant setting through creativity. For example, you could keep all the settings noted at the restaurant but change the rectangular table to a pedestal dining table. The target is remaining as creative and practical as possible. In addition to using a marble dining table, consider giving the room a facelift with popular décor such as gold flatware. The high-end sheen metallic feel helps to scream the dining space is "high end" especially when having visitors. For those who do not love flashy metallics in the dining space, a different high-end flatware will do. Consider going for black flatware that still captures an opulent feeling with a complicated edge. Area rugs are important parts of home décor for both contemporary and modern home designs. 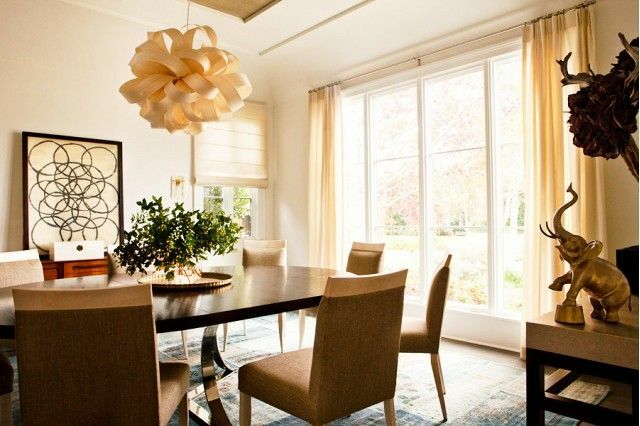 When you add an area rug to the dining room and match it well with a shabby chic dining table, it helps to pull a plush texture that will make everyone miss the next meal. Interior décor experts concur that you can get more with area rugs in the dining room by ensuring they match well with other décor installations in the market. For example, a British dining table will match well with a Moroccan-inspired rug to make the room more appealing. If you want to make a dramatic high-end statement with the dining space, unique wallpaper might be all that you need. You could pick themed wallpaper that highlights your sense of style and make it the focal point for the room. If you love nature, a wallpaper of a mountain, waterfall, or even your favourite dish will be ok. You could also go for a fabric pattern that matches with the window shades and your elegant dining table. The main expectation of homeowners when they set their dining spaces us a lovely table surrounded by matching chairs. But that is the simplest and least impressive. Instead of going for a matching set, consider using stylish pieces that help to compliment the moderndining table. If you like trying new designs, consider going for something like special seats with a fabric such as velvet to match with a glass dining table. Remember that most retro furniture can easily match with multiple themes.